Now that we know how a drag works, we will cover the subject of what is it use for, how do we set it and how do we maintain our drag to ensure that they are in tip-top condition. Why do or line snap when fighting a big fish, assuming that the line isn't injured in anyway, the line snap when the pull force of the fish exceed the test strength or poundage of our line. In my early fishing days, the egg beaters (some kind of cheap Mitchell copy) I had were without drag, if I hook on to fish that can exert more pull force then what the line could take the line would snap. I could use the rod to absorb some of the force but it's very limited. What was needed then was a mechanism on the reel that allows the fish to take on line once the pulling force exerted by the fish exceeded a certain amount, this way if line is allow to flow out the pull force will never exceed the limit I've set and technically the line will remain intact. Today, it's quite impossible to find a spinning without a drag system, even the cheapest has a drag mechanism of some kind. We know that the drags when set correctly prevent the line from breaking, but it also serve another purpose, and that's to tire out the fish. Imagine that you're running and imagine you're running with a rubber tire attached to you and dragging on the floor behind you. Which would tire you out faster? Same logic used on the fish, the drag provide a constant force backward as the fish swims away, this constant resistance will in due time tire the fish out (hopefully before you run out of line) and once it no long able to exert a pulling force beyond the drag limit you've set, the line stops going out, and that will allow you to reel it back. Do you know that you can land fishes that weight more than the poundage of your line, the objective of the fishing line is to bring the fishes near to you so that you can land them with a landing net or a gaff. The aim is use the drags to tire the fish out and then reel them in. All reels will contain a limited amount of line, how you set your drag and micro tune it during the process of fighting the fish, decides if you win or lose. Set too loose a drag and you might loose all your line and get "spooled", set too high a drag and you run the risk of tearing the hook out the mouth of the fish or something breaking. Drag setting need not be a precise action, many people set their drag based on "feel". That's because when you're out there fishing, there will be time when you need to change your drag for one reason or another, the effort needed to set it back exactly to the original setting using a spring weighing scale or weights in the field would be a hassle. Personally I set the drag according to my gut feel, the drag must be tight enough for me to set the hook properly when there is a take and light enough so that any fish with some decent power can take out some line and not snap on the initial run (remember the start-up effect). Once the fish is on, I can slowly tune and increase the drag as I fight the fish. The only time when I set higher drags is at locations where it's rocky or full of stilts (e.g. near kelong), I don't want the fish to have room to run and any initial dash will be met by brute force, that's also the time when heavier line is employed. How much drag to set? Many fishing expert and tackle manufacture recommend 25% or one third of the line test strength (ie 33%). Why this magic number and not 40% or 50%? I have not found the reason yet (if you do please e-mail me), and I am not even sure anyone can give me an answer really. It's probably something that has been passed down through generations and no one bother to ask why along the way. Anyway to set the drag, the first thing you need to do is to decide what ratio of the line capacity do you want to set your drags to. 1/4 or 1/3? After you've decide, take the line poundage and multiply the ratio you want and you'll get the drag setting you need. (eg. 15lb line at 1/3 ratio and the drag setting should be 5lb). Now there's two method you can do the drag setting process, the first you use the spring scale itself, but for this method you probably need two person to do it and the other is the weights method. Before starting, make sure your rod and reel is set up and the line threaded through all the guides, pull out 1 to 2 feet of line and have a loop tied to the end of the line. The tighten the drag using using finger force. Lets start with the weight method, taking the 5lb drag setting we've computed earlier, weigh up some heavy object (sinkers are good cannidate) to the required weight, thats 5lb. Secure the wieght to the tip of the line and lift the rod till it's roughly about a 45 degree angle to the ground. The initial drag should be tight enough such that the weight is lifted in the air, then slowly release the drag knob a click at a time. The instant the weight start moving you've set the drag to 5lb. If your drag is smooth, once the weight drop it should continue droping in a smooth motion till it hit the floor, that's because the Kinetic friction is lesser then the Static friction as mentioned in the previous page. The other method is to have a friend hold the spring scale and to read it for you. Secure the tip of the line to the scale then you do an initial drag setting. The easiest way to do this is to have your friend sit down and with the scale held down, you start lifting your rod to a 45% angle. 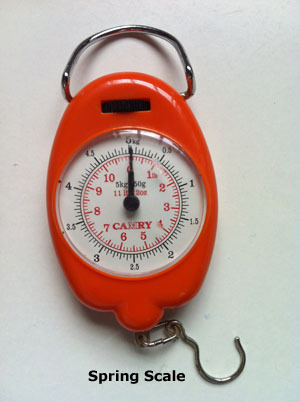 Have your friend read the scale when the drag starts to slips, depending on whether the initial drag is too high or low, loosen or tighten the drag knob accordingly to get to the drag poundage you need. In our example if the scale read 5.5lb and the drag still hold you should stop and loosen the drag a notch and try again. Or if the drag slides before reach 5lb you then need to tighten the drag knob a notch and try again. Do remember which direction is tighten and which is to loosen. Another way to do it with the weighing scale is for you to hold the rod at an angle and have your friend pull down the scale together with your line. If he reach the required poundage, he can hold it at the same position keeping the pull force constant while you slowly loosen the drag until it slips. The latter method is more complicated and you might loose a friend if your knot slip and the rod mack him right it his face. The first method is easier and it also give you an opportunity to see how smooth your drags are when weight continue to fall after the inital "start-up". There are "Wet" and "Dry" drags, but that doesn't mean it's really wet. What it mean is that the drag pads are to be installed "dry" without grease or with a little bit of drag grease "wet". If possible, never let water into your drag mechanism. When rinsing your reel after every trip, tighten the drag to the max to prevent water from getting into the drags, then run the spool and reel under the tap. When you're finshed with the washing, wipe the reel dry and do not forget to loosen the drag as much as possible after that. The reason is that some drag material after being kept under high compression for a long time, it might not be able to recover to it original state when the pressure is release, and that will be a problem for the angler. Well, that's all about drags, thank you for reading.